"Be there before 2pm. KSU 3pm. We will go to Ironhorse Cafe in Hoover, AL after leaving the Children's Hospital for Food and Beverages." "For the last several years, members of our group have been collecting and saving the pull tabs from all sorts of cans. Beer, soft drink, soup, spam, sardines, etc. Any can that has a pull tab used to open it. Once a year we make a "run" (Bike Ride) to Children's Hospital in Birmingham to deliver the collected tabs to them. The tabs are then recycled and the money is used to fund operations of the Birmingham Ronald McDonald House. This run is scheduled for the last Saturday in August every year. The hospital promotes this event to their staff and patients / families. The kids like to come to the lobby to meet us and look at or sit on the bikes. This is an "open ride" and we invite and encourage all individuals and Bike Clubs to join us. We have enlisted the help of friends, acquaintances, and local bars to save their tabs for us. The first year we had about 32 motorcycles and two support vehicles. We delivered 27 gallons of tabs to the hospital. The second year, (last year) we had about 35 motorcycles and four support vehicles. We delivered an amazing 185+ gallons of tabs! 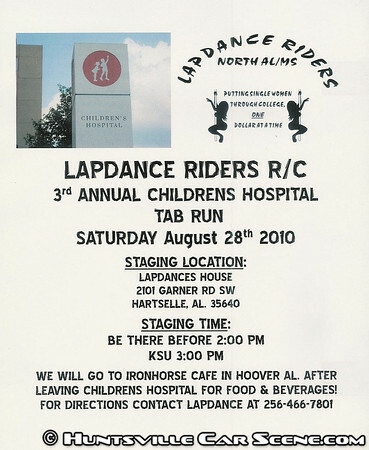 The Lapdance Riders R/C, had also raised some money earlier in the year so we decided to present a check to the hospital along with the tabs. At the commencement of the ride we "passed the hat" and raised almost $200 more! That allowed us to give them a check for approximately $675." This is a wonderful event that gives so much to kids. Come out and ride for a great cause. A record turnout of over 70 bikes took over the streets before the ride. And a record number of tabs almost doubled the donation from last year, and was coupled with a check for over $10,000 from the Lapdance Riders. Way to go! I was able to get quite a few photos of the ride departing as well as most of the riders as they were in route. Lapdance wanted me to get an overhead shot from an overpass, and while I was taking that shot, I witnessed one of the most scary things I've never seen--a rider go down on the interstate. Intermittent rain kept tires and road a little damp, and I think that was the biggest factor in the incident. Tim and Donna went down at highway speeds in the far left lane of I-65 in the midst of automobile traffic and other riders. I saw Tim's bike slide sideways sparking on the pavement and then the other riders in the pack bunch up to avoid hitting him or Donna who were tumbling on the pavement. Traffic slowed to a crawl in all three lanes almost immediately, and riders stopped on the shoulder to help. It was a surreal experience from my vantage point--almost like watching a train derail. Luckily, aside from some really good bits of road rash, neither Tim or Donna were seriously hurt, and both were in good spirits after the incident. Tim asked me if I got shots of the incident--I purposedly didn't. I turned the camera off as soon as it happened. I never want to capture anything that evokes negative emotions or pain. Someone else can do that if they want, but not me. After cleaning up the road rash and being checked out by the ambulance, Tim added some oil to his bike, and it started back up again. It was missing a headlight and had some bent parts, but it still rode. Donna rode in a car as her back was a bit sore, and who's wouldn't be! I'm very glad to see both of them walked away basically unharmed from what could have been very, very serious. God was watching out for the riders today, and the ride ended on a positive note at the Children's Hospital. I want to thank Lapdance, Merlin, Sunshine, Wingnut, and all my friends in the Lapdance riders for their hospitality and coordination efforts. See everyone next year! Thanks Samir, so much, for covering our event for us. I had no idea you witnessed Donna and Tim's accident. She's my best friend. She had no broken or fractured bones.... Tim ended up with a broken shoulder. Sure hate that happened in front of you!! I'm so glad she and Tim were okay Sunshine. Tim felt so bad about what happened. He was more glad that Donna was okay than himself.